Do you find oven cleaning daunting? Are you having a hard time reaching those narrow areas? Worry no more! We have compiled the best insights from real cleaners who do it professionally. 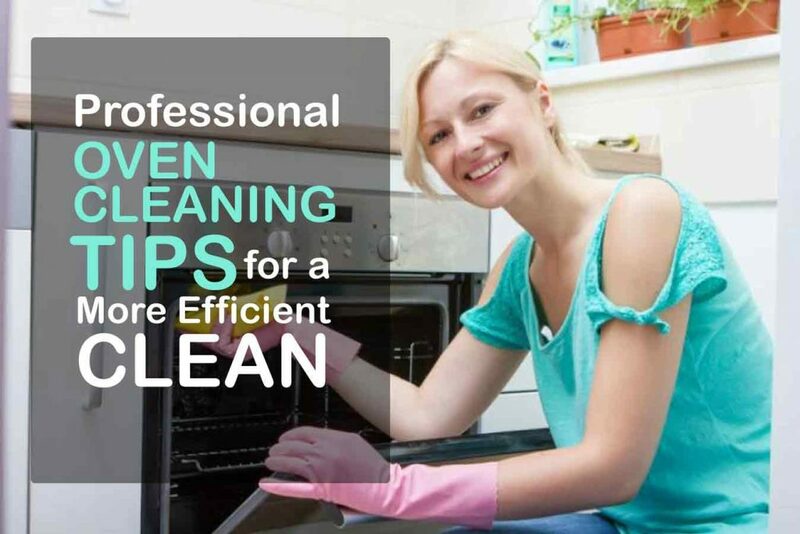 Learn how professional cleaners clean the oven through these oven cleaning tips. Aside from the pay for cleaning services, you will also need to allocate a budget to buy the right solutions. But then, there is always a better alternative to catches. Treat stubborn stains using only white vinegar and soda. Pour inside a spray gun and spray it on affected areas of the oven. Then wipe it after 30 minutes and see the results. Are those dirty shelves bothering you? Soak them in a resealable bag with an oven cleaner solution. Let it soak for 30 minutes then rinse it with water. The same process can be done for the shelves in your fridge. Although there is already the oven, fridge and deep cleaning which is best for that, but you can also do it yourself! Do you have an old toothbrush that is about to be thrown in the rubbish? Well, you can actually use them while cleaning your oven. So, might as well keep them for future usage. If wiping won’t do it, then let glass scrapers deal with those tough stains. Scrape the stains from the oven’s door down to its floor. But if the door is removable, then it’s much better to soak it in warm water. Are you familiar with the old proverb, “fire beats fire”? Then you might be amazed by this oven cleaning tip #5. Nothing can take care of the oily grease in the oven better than the oil itself! Just drop some vegetable oil into a paper towel and then easily wipe it on the greasy areas. Food smells good. But if the smell remains in the oven, the food will not smell as good as it was before. However, that is not so much of a problem with the use of a few drops of vanilla or citrus essence. Just mix it with water in an ovenproof bowl and heat it. Surprised? Well, it’s true! A thin layer of car wax can do wonders on your hob. It will remove built-up grease. Just wipe it all away after it finishes the job. If the 7th item on our oven cleaning tips caught you off-guarded, then how does cream of tartar for shinier stainless oven walls? Yup! You didn’t need to read it again. It’s very effective. Just apply it with a thin cloth and let it dry for 10 minutes. Then wipe it. As effective as they are in your pots and pans, they work best for your oven too. Just dip a dishwasher tablet in warm water then rub it on the built-up grease. Then be mesmerised as the burnt grease will melt its way off your precious oven. To do this, you need your oven completely cooled. Next, spray oven cleaner solution into the corners. Ideally, you need to let it soak overnight. But if you can’t, then at least let it soak for at least 4 hours. And finally, wipe the grime away. Any tasks can be made easier through experience. All the more if you are guided by those who did more times that you did. Insights from professionals are certainly handy in giving us great ideas on tasks that are as complex as cleaning ovens. Make use of these tips as you clean your oven at home. In this way, you can find the task easier and you can do it much better! Then check our blog section while you’re here. Explore the services and perks that we offer. Furthermore, our cleaners are competent and professionals. Our pride is our client-oriented service. Hence, our commitment is to give attention to important details to our tasks. Book with us today and experience the best professional service. Also, are you having a hard time keeping tabs on your cleaning tasks? Well, you might just like our House Cleaning Checklist. Read it now! This entry was posted in Home Cleaning and tagged cleaning tips, house cleaning services, Maid in Perth, oven cleaning.